Datalogic PowerScan PBT9500 - Scanner Only, 2D Imager Scanner, Bluetooth, Cordless, High Performance Liquid Lens, Removable Battery. Interface cables and charging cradle sold separately. 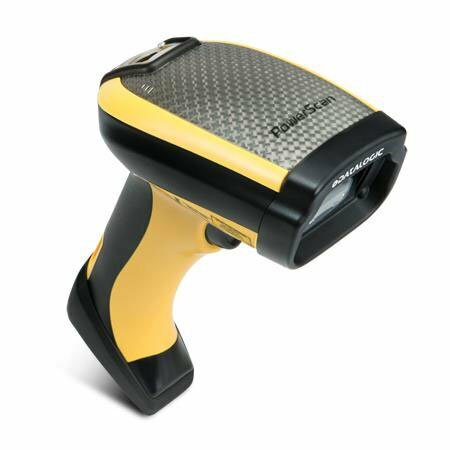 The PowerScan PBT9500 imager is targeted to be the most suitable cordless solution for all applications in Warehouses, Transportation & Logistics and Manufacturing where the barcode is at a handy distance (within 1.0 m 1 3.3 ft), regardless of whether it is a 1D or 2D code. The omnidirectional reading capability combined with the snappiness and the depth-of-field features allow the PowerScan 9500 area imager to be faster and therefore, a preferred solution over standard laser scanners and represent their natural replacement. Additionally, the PowerScan PBT9500 also features specific models specialized for reading codes marked with DPM (Direct Part Marking) technology. The overall mechanics will be the same as the other models, while the optics and the software is optimized to address items marked with DPM technology. The Datalogic PBT9500-HPRB is also known as Data Logic	DTL-PBT9500HPRB	or PBT9500HPRB	.